Monviso is a tribute to the city of Torino, the First Capital of Italy and Piedmont Region. 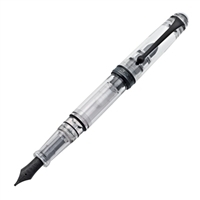 This fountain pen is named for the highest mountain of the Cottian Alps, the majestic range that decorates the city like a crown. 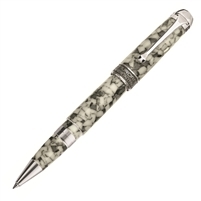 The base of the barrel is sharp, dense black to represent the black granite stone of Monviso with contrasting white snow speckled across it.Then, a layer of smoky wisps of fog that rise from the great Po River, the source of which is found at the base of the great peak.The nib is the highest quality 18 K, individually examined for perfection. And finally, the limited number of 360 for each degree of the 360° panorama. based on the timeless and classic body style of the 88, handcrafted in brown lacquer with gold-plated fittings, a precious 18K solid gold nib, and piston-filling system with hidden reservoir. Similar to rolling a fine cigar, these pens are 100% handcrafted, no two are exactly alike. Limited to just 688 numbered pieces worldwide. Bottle fill only. Gaius Iulius Caesar is without any doubt one of the most important historical figures for Rome and history in general. Caesar held many different titles, from general to dictator, from orator to author, and played an important role in the fundamental transformation from the Roman Republic to the Imperial Rome. Aurora is proud to announce the Limited Edition Gaius Iulius Caesar. Dante Alighieri, in Italy known as “the Supreme Poet”, was born in 1265 in Florence.He was a major Italian poet, writer and politician of the Middle Ages. He is considered as the father of the Italian language. The pen is offered as a Lacquer piston fountain pen with rose gold trims in only 1.265 pieces all over the world (Dante’s date of birth).